Three-weight world champion Adrien Broner has teased a clash with Britain welterweight Amir Khan after speaking face-to-face via. social media. The 25-year old used FaceTime to speak with his rumored opponent Khan over a potential clash in the coming months, and even uploaded the video of the two discussing future plans. "Hey, tell them to make the fight, man, let's get this money," said Broner, a man who recently out-pointed John Molina Jr.
Amir Khan had previously said he will fight IBF welterweight champion Kell Brook, but within the next 12 months, enabling a showdown with Broner around in early June. The Bolton-fighter was initially targeting either undefeated sensation Floyd Mayweather or WBO welterweight champion Manny Pacquiao in a mega-fight but with both of those potential fights unavailable, his attentions have been turned to Adrien Broner. It would undoubtedly be a terrific fight, but also a fight where the 28-year old Brit says it will only happen if Broner steps up to his weight class. 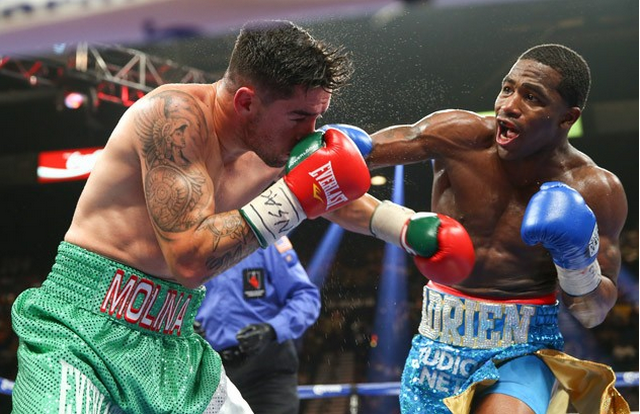 In his impressive record, Broner has only been out-pointed once by Marcos Maidana, a man who put up two great challenges against Floyd Mayweather but was also beaten by Amir Khan himself. Khan recently scored a dominating points win over Devon Alexander in December but has been frustratingly unable to find an opponent worthy of sharing the ring with him. However, with Broner now stepping up his interest and with the two fighters in advanced talks, a clash around June time is now looking increasingly more likely to happen.